This is the first of four posts on the top 120 prospects for the entry draft in June in Newark, New Jersey – the NHL 2013 Draft Rankings – War Room Edition. There have been some interesting changes in the round 4 crowds. 1. The Graduates: These are the players ranked in round 4 last month now ranked in round 3. They will be discussed in the round 3 post. 2. The Newbies: These are players ranked in the fourth round for the first time. Niklas Hansson, Defense, Rögle J20, Sweden – Smooth, puck-moving defenseman who we should get a chance to see at the U18s this month. Will Butcher, Defense, USA NDP U18 – A rough start to the season, Will has really turned it up over the last month averaging over a point per game. Patrik Bartosak, Goalie, Red Deer – Hot, hot, hot; what else can I say? Matt Buckles, Centre, St. Michael’s, OJHL – Big-bodied power centre out of the OJHL; this guy used to be undersized but is now 6’2, 210 lb. Brendan Burke, Portland – Big bodied goalie who just happens to be the son of Sean Burke, a former NHL goaltender. Yes, Brendan has had success but he is still a backup. The best is yet to come. 3. The Relegation Crowd: These are the players previously ranked in round 3. Mason Geertsen, Vancouver – Mason has really struggled since coming to Vancouver. However, teams still love his truculence and pugnacity. Scott Oke, Rimouski – Scott has not been the same guy since Peter Trainor was removed from his line. In addition, his main centre, Frederik Gauthier, really lost momentum at season’s end. Stephen Harper, Erie – Attitude and results just are not there. 4. The Relegation to Below Crowd: These are the players previously ranked in round 4 now ranked lower. Anton Cederholm, Rögle J20, Sweden – Anton had a rough end of the season and appears to have been left of the U18 team. Philippe Desrosiers, Rimouski – It was a rough end to the season for Philippe and Rimouski. Josh Burnside, Mississauga – Need to see a little more offense to be ranked 4th round. Saku Salminen, Jokerit, Sm-liiga, Finland – Of all the guys being relegated, this is the guy I could most likely be wrong on. Antoine Bibeau, PEI – I still think Antoine will be drafted but he needs better numbers to go 4th in his second year eligible. 5. The Big Risers Crowd: These are the big risers in round 4 from last month. Roberts Lipsbergs, Seattle – Seattle is hot and Roberts is just about their hottest player. Juuse Saros, HPK U20, Finland – Continued stellar play in the playoffs. Some of these guys will pan out as planned but historically only about 19% or 6 players from below will make it as full-time NHLers. Burnsville D Teemu Kivihalme is a sure top three round pick. Other Minnesotans who could go high are Jake Guentzel and Blake Heinrich. Burnsville HS, MN HS, D, L, 6’1, 170 lb. Video: YouTube courtesy of cityofburnsvillemn. Chicago, USHL, LW, L, 6’6, 225 lb. Indiana, USHL, D, L, 6’1, 190 lb. Video: YouTube courtesy of IndyIceHockey. Vancouver, WHL, RW, R, 6’0, 184 lb. Video: YouTube courtesy of goVancouverOnShawTV. Seattle, WHL, LW, L, 5’11, 195 lb. Video: YouTube courtesy of SeattleThunderbirds. HPK U20, FIN U20, G, L, 5’10, 181 lb. Södertälje, Allsvenskan, D, L, 6’0, 185 lb. Video: YouTube courtesy of SodertaljeskTV. Oshawa, OHL, C, R, 6’0, 178 lb. Video: YouTube courtesy of JimKorn20. Kelowna, WHL, D, L, 6’0, 180 lb. Linköping J20, SWE J20, D, L, 6’4, 212 lb. Vancouver, WHL, D, L, 6’4, 203 lb. Video: YouTube courtesy of hockeyfightsplus. Lethbridge, WHL, LW, L, 5’10, 202 lb. Blues, SM-liiga, C/LW, L, 5’10, 169 lb. Video: YouTube courtesy of Espoo Blues. USA NDP U18, USHL, D, L, 5’10, 200 lb. Video: YouTube courtesy of TheWindsorStar. Rimouski, QMJHL, RW, L, 6’3, 201 lb. Video: YouTube courtesy of alexlevesque96. US NDP U18, USHL, C, L, 5’11, 185 lb. Video: YouTube courtesy of USAHockeyHQ. Red Deer, WHL, G, L, 6’1, 188 lb. Video: YouTube courtesy of ShawTVRedDeer. Färjestad, Elitserien, D, L, 6’0, 179 lb. Video: YouTube courtesy of gruvarbetarn. US NDP U-18, USHL, LW, R, 5’9, 184 lb. Video: YouTube courtesy of Paul Dionne. St. Michael’s, OJHL, C, R, 6’2, 210 lb. Waterloo, USHL, C/LW, L, 5’7, 156 lb. Eagan HS, HS MN, LW, L, 6’3, 200 lb. Lincoln, USHL, C, R, 5’11, 178 lb. Video: YouTube courtesy of USHLinteractive. 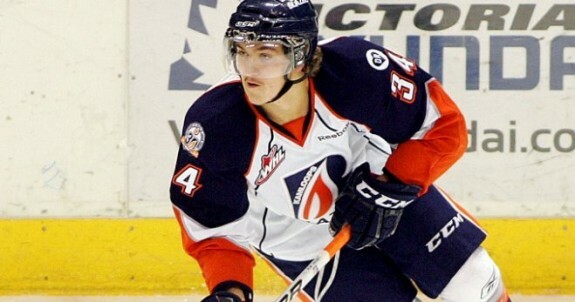 Kamloops, WHL, RW, R, 6’0, 181 lb. London, OHL, D, L, 5’11, 190 lb. Video: YouTube courtesy of CTVLondon. Erie, OHL, LW, L, 6’2, 200 lb. Video: YouTube courtesy of InTheORadio. JYP-Akatemia, Finland-2, LW, R, 6’2, 183 lb. Portland, WHL, G, L, 6’3, 176 lb. Video: YouTube courtesy of GoaltendingLLC. Sudbury, OHL, D, R, 6’1, 180 lb.